I spent time playing around on the Ryerson Index, today and that led me to a notice in Trove. The Forbes Advocate (NSW 1911-1954), dated Friday 17 March 1944. on page 1 had this lovely tribute to my Uncle Tommy. Uncle Tommy, in more care free times. NO ONE said Happy Blogaversary, even though I had a request for all my details, so they knew when it was. Now you have all the questions, here is the Email address to send them answers to. lily@researchbylily.com.au Please put QUIZ in the subject line. Lost in DNA Weekend Part 2. Sunday morning dawned grey and cool but nothing would keep intreped genealogists returning to the conference centre, for more DNA talks. I woke early, as is my habit and went for a walk along the forshore of Darling Harbour. This was my view and in amongst the trees, at the back of the photo I spotted this. I'm now on a quest to find out what is it about. The building, opposite my hotel has a very interesting design. Sunrise was peaking through the clouds and buildings as I made my way back to the hotel and to get organised for the day. Day two of our "Lost In' weekend had the room filling earlier than on Saturday, as we were all aeger to learn more. Heather Garnsey was today's chair and she also gave a short talk on how she broke one of her brick walls, using DNA, but did it? Now the title of this post might have you scratching your head and wondering, 'what is she going on about?' But if you belong to the Society of Australian Genealogists, https://www.sag.org.au/ you will know what I'm talking about. Twice a year the Society has 'Lost In' weekends, covering a wide range of topics, some are face-to-face and some are webinars. Both are great. This past weekend was held at the Portside Conference Centre, Sydney, on Saturday and Sunday. Some of the group, early on Saturday morning. The room was filled, both days. 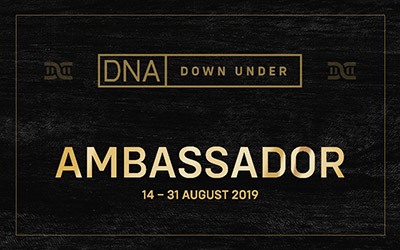 The topic for the weekend was DNA and whilst we aren't NCIS Agents, looking for a killer, we are still trying to find that elusive ancestor, who is just out of our reach. Or so they thought! This month is my anniversary of my joining the world of blogging. For the next four (4) Thursdays I am going to post a question and give a clue as to where the answer might be found. What you have to do is find the answer and the in the LAST post there will be the instructions on how to enter, to win the prize. In the LAST post I will give my email address and the FIRST CORRECT enrty will win. I will be checking the date and time, to be fair. The prize can only be used in Australia, sorry but it works better for me to do it that way. 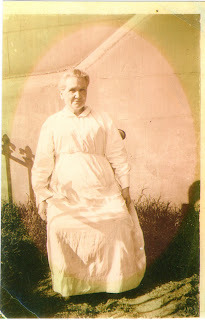 12 Ancestors in 12 Months: Joan Violet SIGRIST. Born 19 November 1920, Died 4 November 1994. Joan was the second daughter of Frederick Sigrist and Elsie Ironside. As a young child, she suffered the loss of her father, when she was six months old and her mother, when she was three. Her and Edna were ‘fostered’ by family members. She travelled to England, where she worked for a while. Joan was a draughtswoman and she drew the maps for the book, The Sleeping City. The Story of the Rookwood Necropolis. Joan was also involved with the ‘Friends of Rookwood’, giving tours and taking photos. Taking photos, opera and ballet were her hobbies. She loved the Joan Sutherland. She also painted and one of her works hangs on our lounge room wall. When Joan died in 1994, she was cremated and her ashes are in a special rose garden at Rookwood. Friday 26 October and it was an early start, for us as we had to be seated by 8.00am for the Wheelchair Basket to start at 9.00am. And it was well worth it! An interesting fact; wheelchair basketball was first played on 25 November 1946, when a group of American Veterans wanted to become active again, after suffering spinal cord injuries, in World War II. Fast and furious is the only was to describe the two games we saw. Game one was New Zealand v Canada, with New Zealand winning. Again the mateship shone through, with both coahes going to the aid of players, who had tipped their chairs over. They were also cheered, like the players, were. There was also a bit of fun, with a Kiwi player giving the referee the evil eye, and the referee and player laughing about it. INVICTUS GAMES 2018 For Our Wounded Warriors Part 1. For three days this week I have been privileged to watch some amazing athletes from 18 counteries. But I digress, as I should first explain what the Invictus Games are. The Invictus Games are the brainchild of HRH The Duke of Sussex, back when he was a serving member of the British Forces, in Afghasistan. He speaks of returning to Britian, by plane, with several critically injured servicemen and the body of a Danish soldier. He later saw the Warrior Games in the USA and from there the idea was born. Last night I attended a writing workshop at Writing NSW, https://writingnsw.org.au/ on Finding the detail: research tools for writers, presented by Eleanor Limprecht. Eleanore has written three novels, many articles and reviews and she gave insights into her research. https://www.eleanorlimprecht.com/about/ You can read more about her books on her website. It was held at Writing NSW, headquaters, at Callan Park. On the handout Eleanore had a quote from Paul Auster, an American writer and director, which said, "The truth of the story lies in the detail." It is the details that we find, for our ancestors that make them real for us and so it should be when we write about them. Eleanor covered topics from Why Research? What are our resources? Types of information. Ways to organise your research. Ethical Considerations. And the one we all struggle with, How to put research aside and write. Next month I’m attending a two day seminar on DNA and as I know next to nothing about mine, I’m spending some time looking at my three DNA test results.